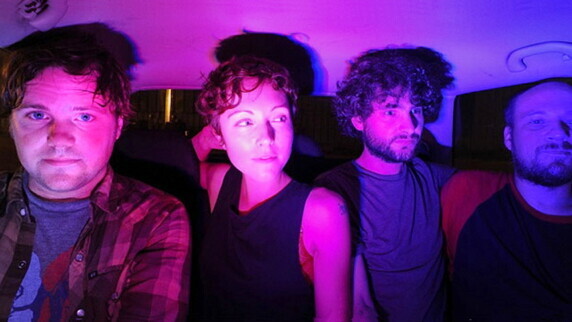 The Minneapolis band Poliça (“poe-lisa”) took a unique approach to band formation: they recorded an album before their first band practice. The project started as a collaboration between Eau Claire alum Ryan Olson and Channy Casselle after their work together in Midwest super-group, Gayngs. The duo began recording music with vocals and electronic effects and then brought in Chris Bierden on bass, Ben Ivascu on drums, and Eau Claire alum Drew Christopherson on drums. The former projects these musicians come from (Mel Gibson and the Pants, Digitata, Roma di Luna, and Gayngs) cover a wide swath of electronic music horizons and this project shines with more pop sensibility then we may have seen before. Since recording, the band has played some shows and are currently on a nationwide winter tour, including a stop at the House of Rock. When fans see the band play live, they’ll notice that half of the band is drummers. But, Christopherson explains, there is more than meets the eye to Poliça. “The electronic parts in the background is very much a part of the music. To say that we are just two drummers, a bass player, and a vocalist leaves out a good chunk of the sound that is going on.” If you want to get a taste of this music first, go to ThisIsPolica.com and check out a few tracks (including Lay Your Cards Out with Eau Clairian and Bon Iver-ian Mike Noyce).